Home→Bed and Breakfast in Beautiful Dorset. Bed and Breakfast in Beautiful Dorset. This has a small separate wing, with its own staircase. The wing has a dining room with a fine open fire. Upstairs there is a double (can be twin beds)bedroom and private bathroom. 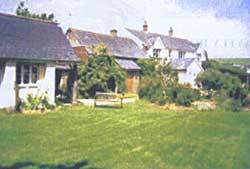 Close to the farmhouse there is a separate annexes, a recent addition to the buildings around the house. It has been thoughtfully designed to provide our guests with a comfortable private retreat. The annexe has a double bed, bathroom ensuite, colour TV, arm chairs and tea/coffee making facilities. The Mayfly Room is an exceptionally useful feature available to all our visitors. This comfortable room is equipped with fridge, microwave and tea/coffee making facilities, greatly assisting those Bed and Breakfast guests who wish to do a little catering for themselves. The room also has a colour T.V, comfortable chairs and a large log fire. Lawrences Farm is a non smoking establishment. To print the form here (PDF Download 12KB) – Go to File Menu at the top left of the browser window > Print. Your booking will be confirmed in writing. Single one night £45. More than one night £40. To add a comment or question, please click on the small yellow icon, below left and a form will drop down for you.